Very interesting paper published yesterday in Nature. It's an experimental paper, reporting the results of a cooperation game in which people try (of course!) 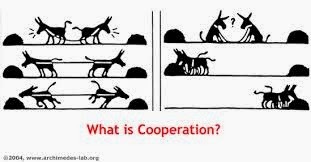 to cooperate, but also have incentives to cheat and take more for themselves. If each pursues his or her own ends without regard for others, there's a tragedy of the commons in which a common pool resource gets wiped out. It takes cooperation and control over selfish actions to avoid disaster for everyone. Lots of experiments have looked at such matters before, of course. This one adds a twist. The twist is to make the experiment more relevant to some of the tricky issues we face today in thinking about climate change, how to preserve the environment, etc. Someone who is today 60 years old doesn't have the same personal stake in avoiding climate change as someone who is 10, because the older one is much more likely to be dead by the time serious effects kick in. The twist in the experiment is to include this cooperation between generations effect. In effect, the experiment probes our abilities to cooperate with the future -- with people we will never meet. Clever idea to try to do this in an experiment, and I think they've managed it quite well. Oliver Hauser and colleagues placed volunteers into groups of five people, which they called "generations." In a typical run of the game, they would give the first generation a common pool of 100 units of wealth, with each of the five individuals in this generation able to "extract" between 0 and 20 wealth units from this pool. Their choice entirely as individuals. The people know that the wealth pool will be passed on to future generations ONLY if the current generation extracts no more than half of it (50 units). Hence, individuals caring about the future generation could choose to extract, say, 10 or fewer units, while those not caring could just take 20. The individuals were told that there actually would be a future generation with some probability p -- say, 0.8. Hence, there's a 20% chance that the game will just end, so no need to worry about future the generation, and 80% it won't, in which case the wealth resource will or will not be passed on depending how people act in this generation. This game repeats for a number of generations as determined by the random process (on average 5 for p = 0.8). In this case, everything goes to the dogs immediately. Interestingly, many people aren't wholly greedy and readily reduce the amount they extract so as to preserve the resource for the next generation of total strangers. The study found that over 20 separate trials, about 68% of the individuals extracted no more than 10 units. Even so, this wasn't enough the overcome the anti-social actions of a greedy minority which extracted so many units that the common pool vanished fairly quickly. In this set of experiments, there were second generations in 18 games, and only in 4 of them was the pool passed on intact through one generation. In the other 14 it was immediately wiped out by over-extraction. Lesson: people aren't all bad, most have pretty good intentions, but the persistent efforts of a small minority of greedy cheaters is enough to mess everything up. In no single case did the common resource pool persist past 4 generations. Maybe democracy can help? An alternative might be to have people in any generation hold a vote on how much of the resource should be passed on. Then, the result (taken as the median or more common choice among the voters) would determine the actual behavior of each and every individual. Freedom would reside in having a vote, not in just being able to extract what you like. As the paper notes, there are some results in game theory that -- in the context of rational, self interested agents playing normal public goods games -- show that this kind of trick gives very good results. When selfish individuals can be strategic about getting something back from their cooperation, they can do so. However, this standard result does not apply in this generational game because no individual can gain anything by being cooperative. The first generation of rational greedy people would simply vote to each take 20 units and the resource would be gone. Who cares about those people in the future, anyway. But of course, that's only if people really are rational and greedy. What about real people? Here the experiments suggest something encouraging. In another 20 trials, the researchers tested this protocol and found that now the resource pools never vanished even once, but were passed on and replenished by the unselfish voting of people for as long as the games persisted. The non-greedy norms of the majority, when linked to the coordinating mechanism of democratic voting, can overcome the greed of the uncaring minority -- in this very simple setting. We have shown that in the absence of regulation, a minority of selfish players consistently deplete available resources. By implementing median voting, however, this negative outcome can be prevented—but only if all players are bound by the outcome of the vote. Votes that are only partially binding, such as the international Kyoto protocol, have little power. More generally, our results emphasize the importance of institutional designers moving away from the assumption of universal self-interest. We extend the ‘behavioural public choice theorem’ by demonstrating how voting can allow amajority of pro-social individuals to override a purely selfish minority, leading to costly group-level cooperation with future generations. Real-world data are consistent with this suggestion: countries that are more democratic also have more sustainable energy policies... Policymakers can do much to promote the public good by using a behavioural approach that is informed by amore accurate understanding of human psychology. Many citizens are ready to sacrifice for the greater good. We just need institutions that help them do so. This final comment reminds me of a European economist who I met several years ago at a European Commission meeting. Very polished, frightfully clever, Oxford and Cambridge, LSE and all that. In conversation, he made fun of all those silly people who recycle and try to take small steps to conserve energy, and had a really good laugh (all on his own) about their little minds and cute intentions to push our world in a better direction. All very silly, he said, because it will never amount to much. Nothing would really matter until it was determined what to do by people such as himself and then put into practice at an international level. What seemed not to register in his brain at all was what all that small-sacrificing behavior actually reflects -- a desire to help, to make a difference, to change things, to care. Many people aren't only self-interested, and all their tiny efforts show it. They want to help solve the big problems. So that final sentence in the paper is exactly right: "We just need institutions that help them do so." And what if I may ask was used as a control group? Was the one group used as a control for the other? Sounds like a paper that should not pass peer-review. You missed the point regrettably the economist made. No matter how much individuals save, the bulk of the problem lies with large industries. You have fallen victim of an effort by the industry to reverse the burden on the individual when his impact is minimal. If they start conserving, they will end up paying more for energy down the road. I think you miss this completely and your approach is emotive like that of most theoretical socialists (not even empirical). Yes, add a few more laughs to those of the economist. He was right. The professional dissertation writers are the best platform where we can get help by writing new techniques. Nothing would really matter until it was determined what to do by people such as himself and then put into practice at an international level. Really nice platform and its tell us how to cooperate with your teacher if you want a bright future thanks for sharing psychiatry residency personal statement . It has to be known that stock market is very volatile and any time it can change the movement. Traders should check the current market or you can also visit Epic Research.